The effort and endeavour from both sides was there to be seen in the middle of the park throughout the half, albeit unable to yield many real chances on goal at either end. Much of Chelmsford’s best work was from long balls and link up between skipper Anthony Church and forward Chris Whepdale. The front man had a speculative effort swirl over the bar from the left side of the area in the opening few minutes, and was put through well by Church a couple of times quickly after. Joe Anderson and Giles also linked well a couple of times, the latter dragging an effort wide. Whelpdale then nearly punished a failure to head the ball clear by Diarra, curling his effort narrowly wide. A couple of flashes across the box around the half-hour mark for the Cards summed up the lack of cutting edge in the final third despite some sound approach play. Max Kretzschmar was just a few yards behind play to be able to latch on to a pacey Cadogan cross. Armani Little then dug out a clever chip down the right channel, Luer receiving it and to his own visible frustration delivering a ball to no Woking bodies in the box. Both respective centre half’s Cook and Diarra then couldn’t get on the end of a corner sent to the edge of the area minutes later, both going to ground one after the other. As the skies literally began clouding over, the Cards were punished for a defensive mix up right before half time. An oncoming Craig Ross and Cook failed to communicate and take ownership of a long punt forward, allowing the pursuing Rhys Murphy to pounce on it, take a moment to set himself despite Diarra’s best efforts to stop him, and produce a measured finish from the edge of the box. The Cards then went the closest they had done since the opening minute in first half stoppage time. A deep cross from Josh Casey was well met by Diarra, heading firmly and forcing a tip over the bar from McDonald. Diarra was then found again from the follow up corner, his header this time crashing off the bar, but it would have been ruled out for an infringement anyway should it have gone in. Woking mirrored the start made in the first period, again going close in the opening minute of the half. Following really good link up play between Little and Kretzschmar, the former eventually got a cross off from the left which via a deflection turned into a goal-bound effort, headed off the line by the centre half. Chelmsford had made a few inroads down the attacking left in the opening minutes and went close by way of a flash header from defender Micky Spillane, the attempt just spiralling wide of target. The continuation of much industry and endeavour from both sides in the middle of the park kept the game ticking over at an energetic pace, the competitive nature of the contest resulting in the first cautions of the game to Whepdale and Church. Neither keeper was being properly tested, efforts reduced to many blocked crosses and shots. For all the intent it was likely to be another momentary lapse or a set piece that would either restore parity for the Cards or double the home side's advantage. Unfortunately, it proved to be the latter. It was former Card Chez Issac the instigator, first firing a free kick hard from the edge of the box and forcing a save from Ross, out for a corner. The resulting delivery, provided by Issac, managed to find Adrian Cascaval at the back post and he buried his header on the stretch on 71 minutes. Straight after the goal Dowse made a change, Reise Allassani coming on for hard grafting James Ferry. Kretzschmar came more into the game in the second half, and was at the heart of the Cards late efforts to try and rescue something. He had a couple of efforts on goal, having a strike blocked following a nice link up between Luer and Josh Casey. He then forced a save from McDonald, striking a free kick excellently from 25 yards, the ball very much on target, aimed just under the bar. Late on his deliveries into the box found Diarra who again was unlucky not to nod home, and late sub Harvey Bradbury also headed over the bar. Giles and Reynolds were sent through late for the home side and should have done better with their respective efforts, the latter making the most of minimal contact from Cook in an attempt to win a penalty. Five minute of injury time presented the Cards an opportunity to push for some consolation, but it wasn’t to be. In a hard-fought contest the Cards will rue their lack of end product. 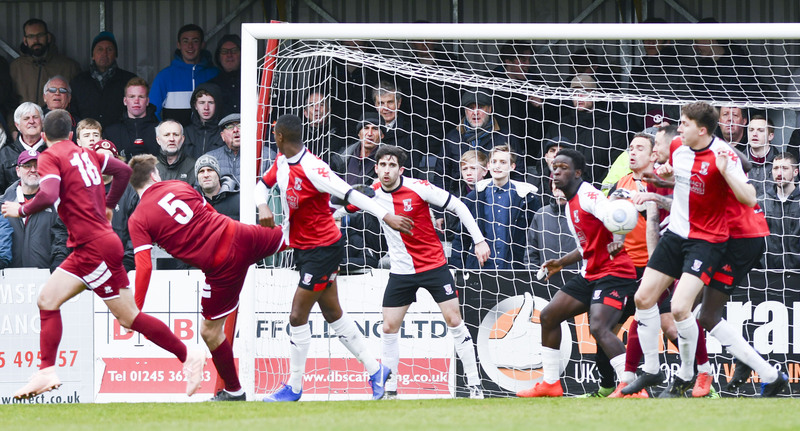 The energy of Ferry and particularly Little, and the best efforts of Luer and Kretzschmar in spells up front, just couldn't get past well drilled, hard grafting opposition in Chelmsford, who were clinical when it mattered today. Dowse will be frustrated by the manner of both goals, and reflecting on previous weeks hope the Cards get back into more positive habits at both ends of the pitch prior to the play offs. Man of the Match: Armani Little – at the risk of sounding like a stuck record, the midfielder was constant with his willingness to try and make things happen, led the best example in keeping the Cards competitive in midfield when it was really vital today.